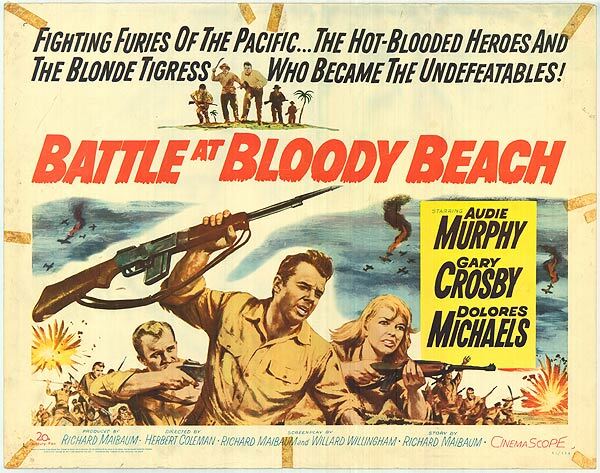 BATTLE AT BLOODY BEACH —-is of curiosity in that it’s the only war movie Audie Murphy appeared in besides The Red Badge Of Courage and To Hell And Back; the real-life WW2 hero instead shooting things up in 33 westerns of mixed quality. This awful 1961 programmer has him noticeably ill-at-ease, and his embarrassed performance here might be his worst. Supposed to take place in The Philippines, but filmed on Catalina, which looks about as tropical as Pennsylvania. 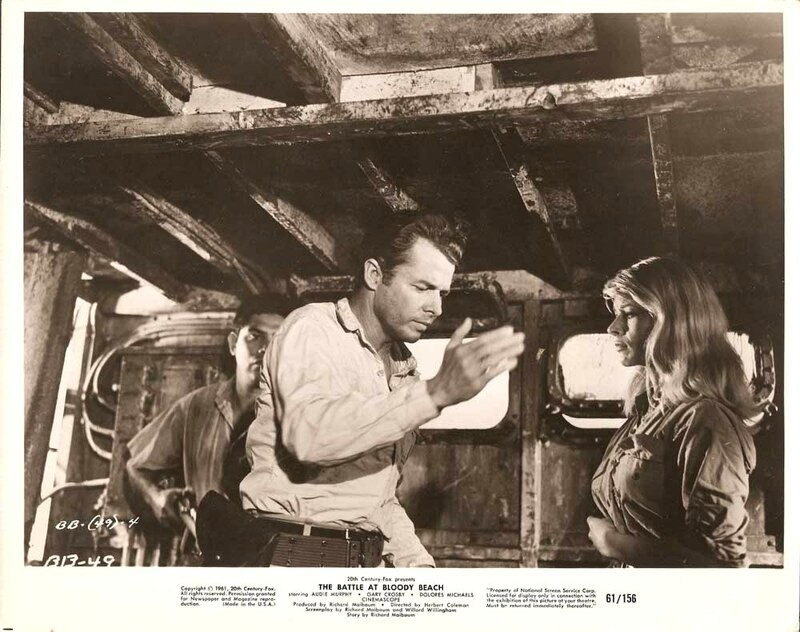 The terrible script came from Richard Maibaum, who’d done some okay actioners prior and followed this with the first four smashing Bond films (and nine more later). He must have cranked this one out while undergoing migraines, its situations are so ridiculous. Terribly helmed by Herbert Coleman, who had been a second-unit director on five classic Hitchcock movies. Whatever he learned from Alfred was AWOL here, as Murphy and his group of civilian refugees and Filipino guerrillas mow down dozens of the most inept Japanese soldiers outside of a Godzilla saga. Dolores Michaels hairstyle is straight out of Malibu, Alejandro Rey is ‘introduced’ and yells a lot. Gary Crosby gets eaten by a shark, so something worthwhile occurs in the 83 minutes of tedious claptrap. With Barry Atwater, E.J. Andre, Ivan Dixon, Miriam Colon, Pilar Seurat. What occurred in The Philippines from 1941-45 was so horrific that it makes this sloppy balderdash hard to stomach. Box-office result: $1,200,000.